The Galaxy S8 was one of the first smartphones on the market last year capable of hitting gigabit LTE speeds. A test conducted by T-Moile revealed that the handset could achieve download speeds of over 900Mbps. However, the test was conducted in a lab and it was impossible for the average user to achieve speeds anywhere near that in real-world conditions. As one can imagine, the Galaxy S9 has a gigabit LTE modem as well which means it can hit some enviable speeds. Some carriers are now using 5GHz unlicensed spectrum which is commonly known as the Wi-Fi spectrum as part of their LTE networks. This lets them significantly improve speeds for public LTE networks ahead of the commercial roll-out of 5G. This is what’s called Licensed Assisted Access (LAA) and AT&T’s new LAA network enables the Galaxy S9 to hit peak speeds of over 500Mbps on LTE. The folks over at PCMag tested several AT&T LAA sites in downtown Chicago using a regular retail Galaxy S9. They were able to achieve these speeds out on the street on a public network and not at a test site. AT&T is far from the only carrier that’s doing this. T-Mobile and Verizon are also installing Licensed Assisted Access sites in major cities across the country. That being said, it’s important to keep in mind that LAA is an urban solution because the spectrum can’t travel far. You won’t likely be able to hit such speeds in the comfort of your own home. 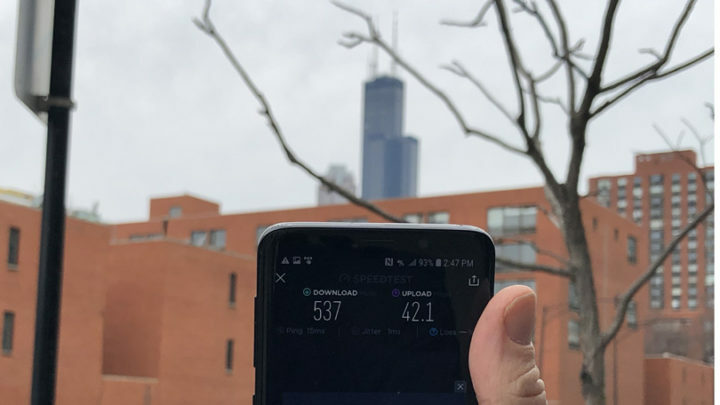 The four sites tested by the scribe had radiuses between 150 feet to 400 feet so you’ll likely have to stay outdoors for extended periods of time if you want to take advantage of super-high LTE speeds. AT&T is rolling out its LAA sites in several cities across the United States including San Francisco and Los Angeles. It plans to launch LAA in at least 24 cities this year. The four different sites returned different speed results depending on the level of congestion of the site itself and also of the surrounding sites. The speeds were always above 250Mbps at all four sites and managed to hit 537Mbps at the third site. Despite considerably improving downloads, LAA doesn’t do the same for uploads which continue to run on the dedicated LTE spectrum with speeds of up to 43Mbps. AT&T subscribers can access the LAA fast lanes provided that they have a compatible device. The Galaxy S8, Galaxy S9 and the Galaxy Note 8 are the only Samsung devices that support LAA right now.